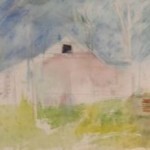 A Friend’s House – Sue Roby 2009 > From this time one, Sue began to make several starts for each painting project. Here, she had trouble with perspective, color, and details. 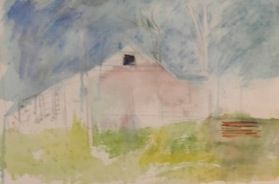 Newfoundland B&B – Sue Roby 2009 > This is a pretty convincing result though she struggled with color and perspective and needed help along the way. 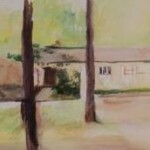 The Neighbors – Sue Roby 2010 > Many beginnings here but nothing was finished. She would get just so far with a scrubby, rough appearance, see problems, and start again. Arizona House – Sue Roby 2010 > After several troublesome starts, here she pasted a couple of images together. She also removed paint and repainted. She used to do this occasionally but now began to do it quite frequently. This also marks the beginning of totally unfinished projects. There were many beginnings but no more paintings met her expectations. Tom and Mary’s – Sue Roby 2011 > Again, many starts but nothing completed. One beginning showed three separate outlines of the house on top of each other, all askew. This image has incomplete drawing, paint roughly laid in with some removed. At some point, she just quit, wanted to finish but didn’t want to finish. Coloring Book – Sue Roby 2011 > Getting Sue to begin a painting as she used to was no longer going to happen. On a suggestion, we took a page from a coloring book and she just colored it with squiggles of crayon. It was suggested that Sue was finding pleasure in moving her hand back and forth on the paper. Her pleasure in this seemed so-so. 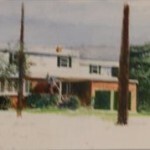 Doc’s House Later – Sue Roby 2012 > This is actually the photo from which she traced the image onto her paper. She drew so many extraneous lines that she couldn’t tell what to paint. On a couple of occasions, I made the tracing onto the paper for her. She would add more lines, get lost, and quit. 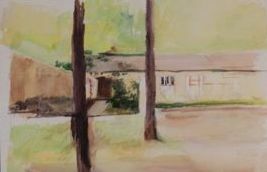 The Last Doc’s House – Sue Roby 2012 > As time went on, Sue need help and encouragement getting set up and starting to paint. 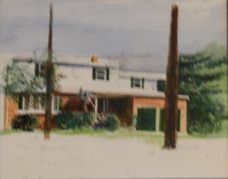 Here, as she often did, she blackened the back of the photo, erratically, then drew on the photo to transfer it to her watercolor paper. But, she just covered the photo with many, many lines, and quit.